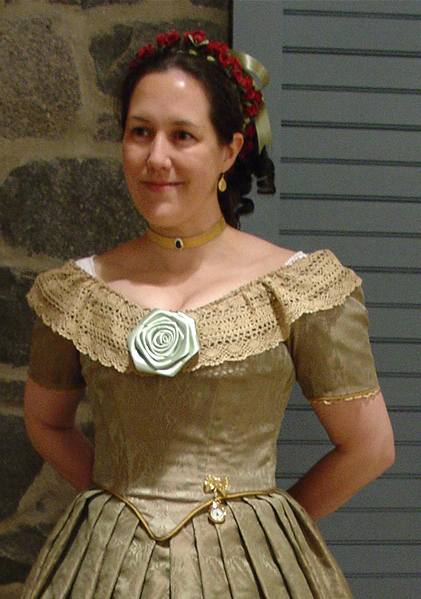 This richly colored civil war ball gown brings to life the crinoline era, or early Victorian period. The rich moss green and gold damask is complimented with antique gold lace and piping, which was inspired by a gown from 1860 in the Kyoto museum. The smooth line of the body emphasizes the small waist with wide shoulders and the width of the hoop. The bertha, or lightly gathered lace section across the neckline, emphasizes the width at the shoulders and creates a lovely frame for the face. The antique gold piping pulls out the gold color but also reinforces the bodice and arm edges while being decorative. Piping was a very popular decorative and reinforcement element in the civil war period. This gown is made from a modern rayon and polyester blend, but it was used because of the original gown it called to mind and because with bulk of the fiber being rayon, man-made but still a natural fiber content, it remains comfortable while having the right drape of heavy silks. When I saw this fabric, it reminded me of a gown in my Kyoto book and by replacing the white with gold I used the original gown as inspiration and guidance in shaping and trimming this gown. I have since replaced the rose with a gold silk rose to better match the original.